Update: While it’s still possible to buy the original Nintendo 3DS XL, the handheld is looking a little long in the teeth compared to Nintendo’s more recent hardware releases. 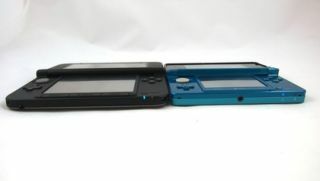 The New Nintendo 3DS XL directly replaced the original model back in 2014, and in 2017 the Nintendo Switch arrived to bridge the gap between handheld and home console machines. With that said, the original hardware is a good choice for those on a budget who want to catch up on some slightly older games. Read on for our original review of the console from when it was first released. The Nintendo 3DS XL is now on sale in Europe and boy does Nintendo need it to sell well. 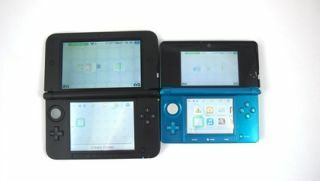 The UK release of the original Nintendo 3DS last March didn’t go as smoothly as the house of Mario might’ve hoped, see. A high £230 price point and a general lack of games post-release meant that many handheld gamers simply couldn’t see a reason to upgrade from their existing DS systems. Now, a year on, and the 3DS is finally delivering on its promise of succeeding on the original Nintendo DS’s high-profile legacy. Massive franchises such as Mario 3D Land, Resident Evil Revelations and Metal Gear Solid: Snake Eater 3D have prop up a roster of solid core games, while a price reduction and rich digital offering further tempt the masses into stumping up for an upgrade. You can probably see then why – in the eyes of Nintendo at least – now’s as good a time as any to release the first 3DS revision, the Nintendo 3DS XL. If you’re in Europe, the 3DS XL is on sale already. US and Japanese customers will have to wait a little bit longer: their launch date is the 19th of August. The 3DS XL price is under £200 in the UK and is available in silver, blue and red variations. As expected the specifications are largely the same – except the device itself is larger. 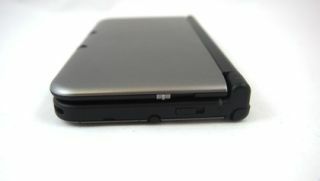 The main selling points of the 3DS XL are its 90 per cent larger screens, the top of which has been increased from 3.58 inches to 4.88 inches, making it the biggest Nintendo’s ever included on a handheld. The lower touch screen meanwhile has been increased from 3.02 inches to 4.18 inches. As you’d expect the increased screen size and added bulk means the new handheld is a bit heavier, up from 235g to 336g compared to the original 3DS, with overall dimensions of 134 x 74 x 21mm. Aesthetically, the 3DS XL’s ditched the glossy finish of the regular model and adopted a matte plastic material which, if you ask us, it doesn’t look quite as good as its smaller cousin – however the new plastic is a lot more smudge resistant. The positions of a few buttons and inputs have changed; the headphone port has been usefully moved from the bottom center of the portable over to the left hand side, and the wireless communication LED has been dragged off the side of the unit so that you can see it from above – another convenient change. 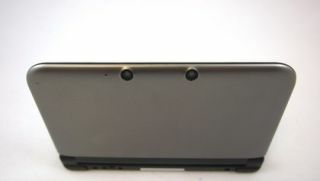 Meanwhile the Select, Home, and Start are now physical buttons and the much-criticised positioning of the stylus on regular 3DS model has been moved to the right side of the portable where it’s far, far easier to reach. 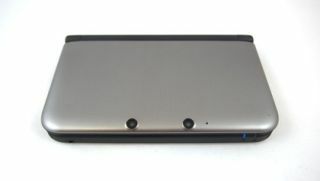 As with the original 3DS, the XL only includes a single analogue control stick, so if you want to fully experience 3D action titles like Monster Hunter and Metal Gear Solid: Snake Eater 3D, you’ll need to purchase a modified version of the Circle Pad Pro accessory, which is promised for future release (existing Circle Pad Pro accessories are not compatible with the 3DS XL). One welcome addition out of the box is boosted memory; where the original 3DS came with a 2GB SD card, the 3DS XL gets a 4GB one to store all your Nintendo eShop downloads . The compromise is unless you live in North America you won’t get a charger; European and Japanese customers will need to buy their chargers separately, although if you already have a 3DS, DSi or DSi XL you can use their chargers with your new 3DS XL. The move is clearly to cut costs, as Nintendo reckons that the majority of 3DS XL buyers will already own a Nintendo handheld and, to be honest, you probably do. If not don’t worry too much – a new charger will cost around a fiver from all good outlets. 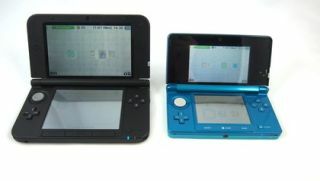 In terms of size the 3DS XL, when closed at least, is comparable to a PS Vita or the original Nintendo DSi XL. Despite being larger than last year’s 3DS though, the XL actually feels skinnier and far more comfortable than its predecessor. We found that the vanilla 3DS could cause our hands to ache after extended play, but thankfully this is far less of a problem with the XL model thanks to its more rounded edges. 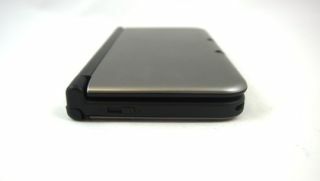 The matte plastic finish means finger prints on the inside of the device are far less of a problem, although we don’t think the XL looks any way near as good as the original 3DS when closed. The metallic paint on the upside of the device simply isn’t as sleek as last year’s pint-sized portable, and if anything the XL looks a bit cheap in the comparison. The 3DS XL again features dual 0.3 megapixel cameras (the front-sided of which can take 3D snaps) and the glasses-free 3D effect on the top screen is controlled by a 3D slider, which this time around is slightly larger and requires a final ‘click’ to activate or turn off the effect, which is a nice addition. Meanwhile the stylus is now more akin to that of the original DS and its own super-size revision, the DSi XL. You can no longer ‘slide’ the pointer to half – or double – its size, but as mentioned on the previous page it’s now far, far more conveniently place on the XL unity – meaning you don’t have to stop gameplay and flip the whole unit around the get your hands on it. One of the best changes Nintendo’s made to the outside of the XL, though, is to its hinge. 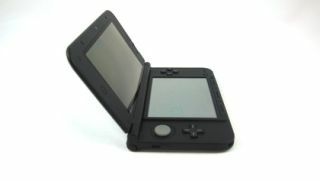 The original 3DS, when opened, was a bit loose and could only be ‘locked’ at one single point – fully opened. The XL now features two ‘lock points’ which means users can now set their screen at fully open or half way – perfect for placing the device on a desk and using the stylus for touch gameplay. As mentioned on the previous page the increased battery life is another big attraction of the revision – so those big screens won’t mean big battery disappointments. 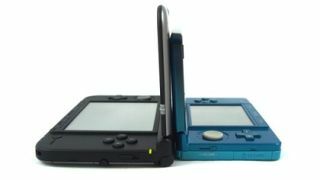 Nintendo says your portable will now last between three and six-and-a-half hours when playing 3DS games, and between five and eight if you’re playing original DS games. In sleep mode the battery life is even more impressive, keeping its charge for days at a time. Of course the absence everyone’s talking about is the lack of a second Circle Pad analogue nub, which Nintendo added to the original 3DS via the bulky Circle Pad Pro peripheral. We have to admit this is a little bit disappointing, as games such as Resident Evil: Revelations and Kid Icarus: Uprising benefit hugely from the added control, but Nintendo claims its presence simply would’ve made the device even larger. Our cynical side suspects it will turn up in a future 3DS model.